Former Rangers player Bob Turpie sadly passed away recently. 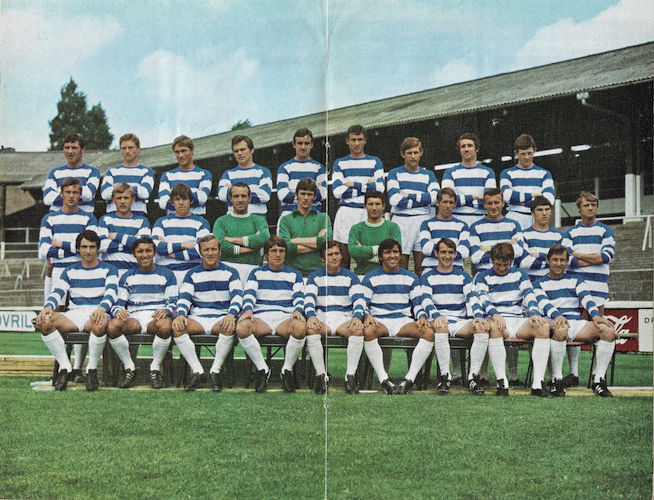 The 1966/67 Club handbook states that the previous season, Bob made 17 appearances for the QPR South East Counties Division One League side, and scored nine goals. He signed pro-forms in November 1967 and during that season Bob played over 40 combined games for the juniors and reserves. But it wasn’t until the 13th September 1969 that Bob actually made his first team debut when he came off the bench at Portsmouth. Mike Kelly was carried off in the second-half and Ian Watson took over in goal. Incidentally, this was Gerry Francis’s first full debut after previously coming on against Liverpool in March 1969. Bob went on to start the match at Blackburn four days later in a game that was also eventful. Mick Leach scored a late winner and Alan Spratley the R’s keeper, was attacked by a home fan! Unfortunately no further first team appearances followed and in July 1970 he was transferred to Peterborough United. Good article Steve. I had not realised he had been at the club for such a lengthy period. I was at that midweek away fixture at Blackburn where we won 1-0 and saw Bob in his only 90min first team game for the R’s. He played at Full Back. Yes I remember him well, sorry to hear he has gone, RIP. We also lost another great servant last weekend Roy Bentley , who I met some time ago when he was in his 80’s a real gentleman, signed my pictures of him, and said that Alex Stock was the best manager that he played for. I did put up some pictures of him recently.